Warm, fresh out of the oven fruit filled crisps are delicious crowd-pleasing summertime desserts - and treats that those following a gluten-free diet can enjoy. Crisps are a rustic dessert featuring seasonal fruit cooked with an oat-based streusel topping. The contrast between the thick layer of warm fruit and crunchy, crumbly​ spiced topping is divine, even more so if you add a scoop of vanilla ice cream on top, which melts into both dreamy layers. The cornstarch helps to thicken the blueberry filling, but be sure to check the label when purchasing cornstarch. While cornstarch in its pure form is gluten-free, not all brands sell pure cornstarch, processing it in facilities that also process wheat. Argo and Bob's Red Mill both sell gluten-free cornstarch. Along the same lines, rolled oats are naturally gluten-free but often harvested and processed along with gluten grains, the risk of cross-contamination high and unsafe for those following a gluten-free diet. Keep an eye out for rolled oats labeled "gluten-free" in your supermarket. Pre-heat the oven to 400 F. Line a rimmed baking sheet with a silicone mat or parchment paper. Combine the oats and chopped pecans in a small bowl, then spread on the baking sheet in an even layer. Toast the oats and pecans for 10 minutes in the oven. Remove and pour contents into a separate bowl. Set aside to cool. Rinse the blueberries and remove any tiny stems. Add the blueberries and lemon juice to a medium-sized pot and stir gently until the blueberries are coated with the lemon juice. Heat the pot of blueberries on the stove over medium heat. Add the sugar and cornstarch, stirring gently until the blueberries are well coated. Continue to cook, stirring frequently, as the blueberries burst open and sauce forms. Remove pot from heat when the blueberry sauce thickens, about 10 minutes. In a separate medium-sized bowl, combine the topping ingredients: Rolled oat and pecan mixture, brown sugar, gluten-free flour, cloves, cinnamon, salt, and cold pieces of butter. With a pastry cutter or two forks, cut the cold butter into the mixture until everything is well combined and there are no large chunks of butter remaining. Sprinkle the topping in an even layer over the blueberry filling. Bake, uncovered, at 350 F for 20 to 25 minutes, until the blueberry filling is bubbly around the edges of the dish. Remove crisp from the oven and let stand to cool for 15 minutes. 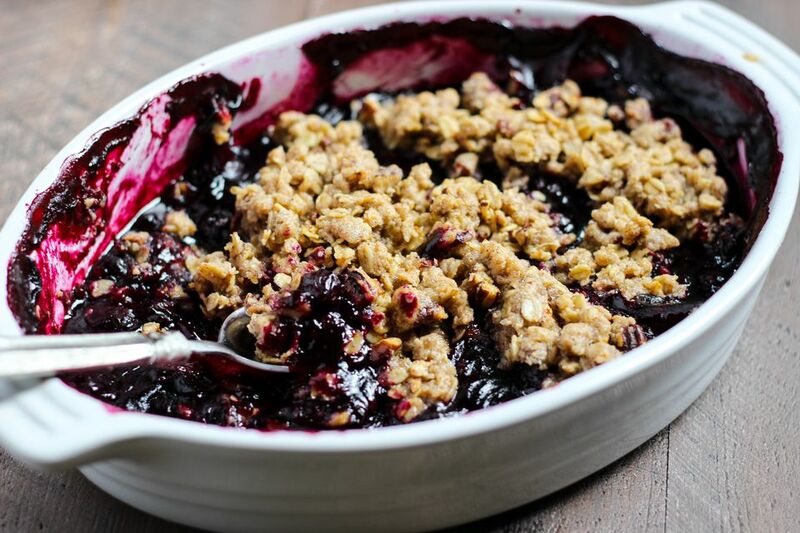 Divide the gluten-free blueberry crisp into six bowls (or less, for larger servings). Serve with a scoop of vanilla ice cream on top, if desired.